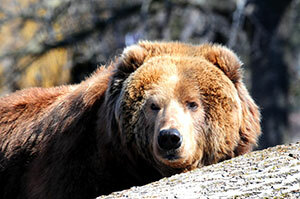 The Zoo regrets to announce the death of female brown bear, Aurora, on March 13. Aurora was approximately 14 years old, and resided at the Zoo on exhibit with her brown bear companion, Boris. The Initial necropsy (an animal autopsy) report showed Aurora had at least two tumors; a very large one on one of her ovaries and one on an adrenal gland. She died due to septicemia secondary to a small intestinal rupture. Tissue samples will now be analyzed for further findings. Aurora was a visitor favorite, and a beloved member of our Zoo family. She will be missed. Zookeepers are closely monitoring Boris, both physically and mentally, for his continued welfare.